It has almost been a year since the introduction of the ROG Strix HERO and SCAR mobile gaming laptops from ASUS. Both systems come in almost identical hardware specifications, and it is hard to differentiate between the two models. In fact, they even share the same model number – GL503. So… what really sets these two models apart? The ROG Strix HERO and SCAR editions are targeted for MOBA and FPS gamers respectively. Don’t ask me why they have decided to go with those names for the model. Perhaps, when playing MOBA games, you play as a HERO, and you are expected to get a SCAR in FPS games? 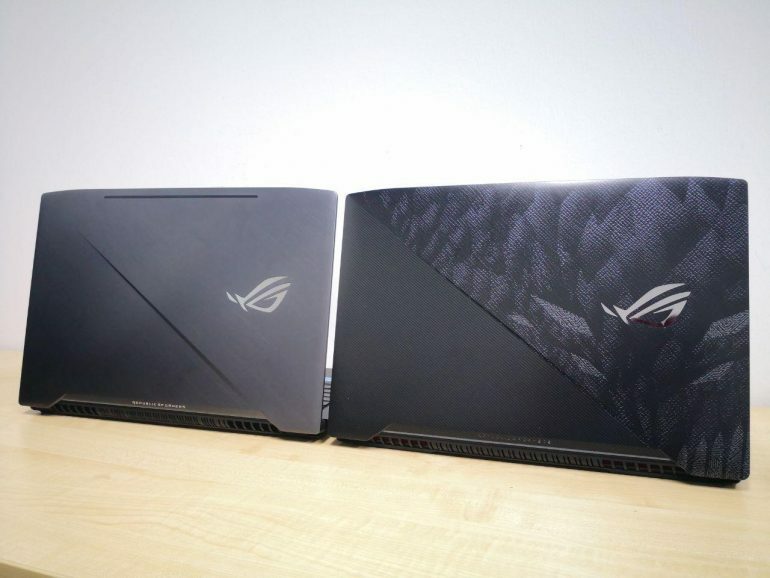 Both the ROG Strix HERO and SCAR comes in the 15.6-inch size. The latter also has a 17.3-inch version available in stores for purchase too. The HERO comes with the unique Mayan styled design that has been seen in many of the latest ROG products. On the other hand, the SCAR has a rather more conventional and minimal design. The lid also looks a tad more premium, as ASUS has used brushed aluminium in place of plastic on the HERO. Personally, I preferred the simpler design on the SCAR, as it seems to exude a more professional profile. The patterns on the HERO are nice, but due to the way that they are imprinted on the lid and palm-rest, they felt like decals pasted on a notebook computer. The carbon fibre patterns on the SCAR looked more integrated to the whole chassis. The ROG design team was very thoughtful when it came to the HERO and SCAR. Understandably, as the HERO is made for the MOBA gamers, they have highlighted the QWER keys on the notebook. The SCAR had WASD keys highlighted instead. Additionally, for the SCAR edition notebook, its WASD keys stands out from the rest as they have a 0.25mm concave to them. This allows the gamers to directly locate these keys easily while during an intense game. The HERO comes with the NVIDIA GTX 1060, while the SCAR comes with a GTX 1070. Both are great graphics card that can support the latest titles at 1080p resolution without much sweat. Of course, the GTX1070 will perform better, which is suited for the SCAR’s use case. The SCAR also comes with a larger 256GB NVMe SSD and 1TB SHHD, while the HERO only settled with a smaller 128GB NVMe SSD option. A responsive display is one of the most important feature of a gaming notebook. This is also why ASUS has both the ROG Strix HERO and STRIX to have display panels that refreshes at 120Hz and 144Hz respectively. Understandably, due to the fast-paced nature and needs for accuracy on FPS games, the 144Hz display will give gamers the edge as compared to any other displays with slower refresh rate. Gaming experiences on both the HERO and STRIX are great, as they are supported with the ideal hardware for the types of games which they are designed for. By looking at the differences between the ROG Strix HERO and SCAR, we can obviously see that the SCAR is the model that has got more premium feature and specifications, and therefore, will cost more. The SCAR retails at S$3,498, while the HERO costs S$2,698. Luckily, ASUS is currently having special deals at PC SHOW 2018 for their gaming notebook computers. Both models are currently S$200 off from their usual price! If you are looking for a new gaming notebook computer, do look out for these two models. You have 1 day left! do you know if they use the max-q versions for their GPU? the GPUs in these models are not max-q versions.